Discover the splendors of Colombia on a 4-week itinerary winding through paradise beaches to the roots of ancient civilizations and infamous kingpin Pablo Escobar, branching at the high-altitudes, mysterious mini-desert, and the jungles of Amazon! If you have more or less than one month, read on to catch the highlights, tips, and tricks! Our route is easily divided into 1-week, 10-day or 2-week itineraries and we drop tips on how to book cheap internal flights and expand your trip up to 2-month exploration through Colombia. Colombia is enormous and versatile; experiencing its various faces takes weeks. I mean, where else you can experience so much on the same holiday, inside just one country? 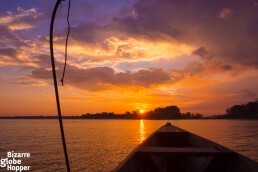 The Caribbean beaches, archeological sites, mountain treks, and other adventurous activities are some of the best in South America, and the Colombian Amazon remains relatively unspoiled, unlike the Peruvian and Brasilian sides. Your next question might be: Where to go in Colombia if you have one to three weeks or even a month to spare? We tried our best to squeeze the secret ingredients into the ultimate one-month itinerary around Colombia. This ultimate Colombia travel itinerary combines the most iconic sights with carefully picked hidden gems and authentic experiences. But don’t worry if you have just one week or 10 days in Colombia, we still have you covered! If you’re short on time, just pick any one-week loop and I’m pretty sure that the magic of Colombia will lure you back later. 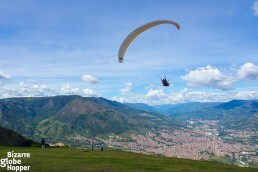 Take off with us and start to plan your own adventure into the heart of Colombia! 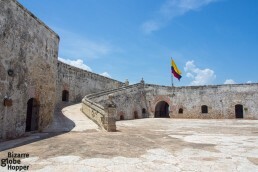 Start your 4-week tour around Colombia from the cobbled streets of Cartagena de Indias. Visit Spanish castles, feast on culinary delights, and just wander around the old walled city spellbound. Cartagena has probably the most picturesque old town we’ve ever visited. The pastel-colored colonial houses cast well-needed shadows into hot afternoons, and bougainvilleas hang from the pillared balconies like clouds from the paradise. The turquoise Caribbean lures you to take a boat to dreamy beaches and small islands, the nearest called Tierrabomba being just 20 minutes’ ride from the shore. Less than four days won’t be enough to experience Cartagena at a relaxed pace. Plan to unwind and indulge in the Colombian culture. Roaming around unintentionally unwraps the secrets of this old colonial city. Local and international restaurants cater to your every craving, and a couple of small specialty coffee houses give a perfect introduction to the coffee heritage of Colombia. 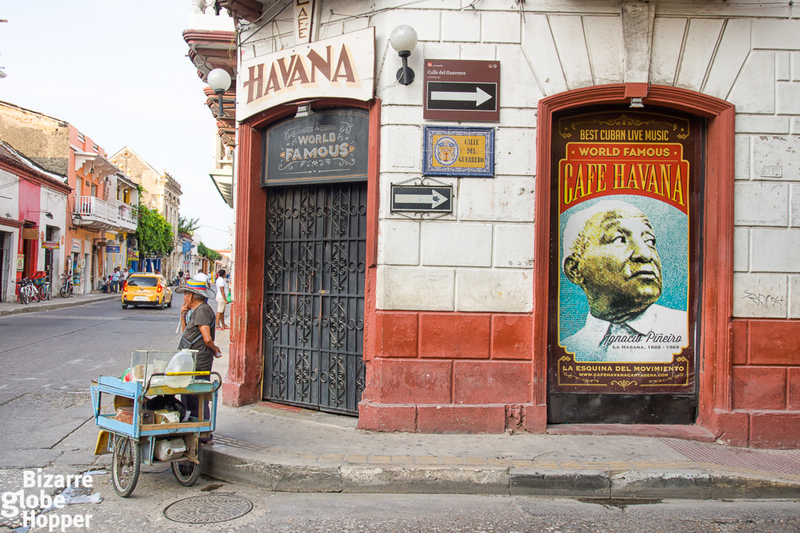 Check out an article about the best cafés in Cartagena and get charged up! Colombian coffee beans are among the best in the world. There are several cheap, daily flights from Bogota, so don’t bother with the exhausting bus trips or drives. We paid around 30$ per person for the one-way ticket, and even cheaper fares are available. Save time on transits to squeeze more destinations into your Colombian itinerary! Get sun-toasted at the immaculate Caribbean beaches, dip in the turquoise waters, and admire majestic boulders that have witnessed the rites of ancient civilizations. 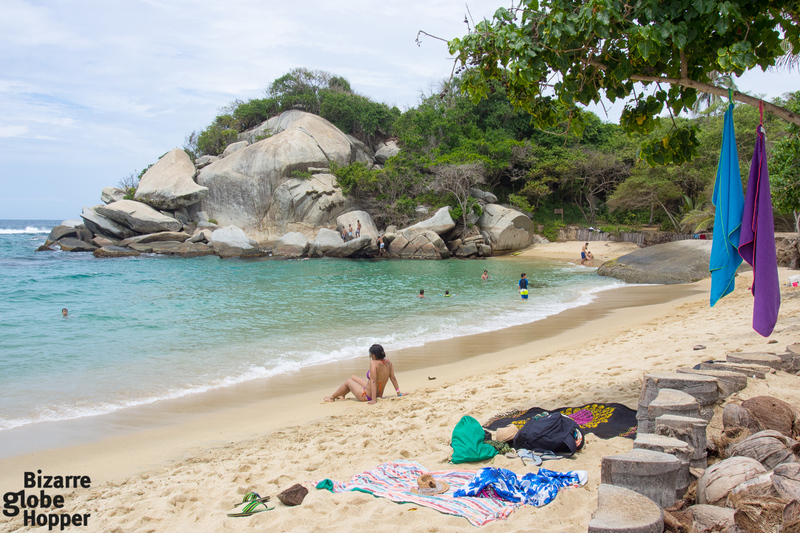 Tayrona National Park is made for an adventurous day of beach hopping, snorkeling, and hiking or horseback riding. In the backdrop of Sierra Nevada mountains lurks the pre-Hispanic ruins of Pueblito, the town of Tairona people, which sees surprisingly few tourists. 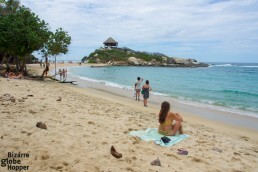 The charm of Tayrona National Park can be experienced in one long and adventurous day, but it will entice you to linger for more leisure beach time. Tayrona National Park is the most visited park in Colombia for a reason and shouldn’t be skipped. 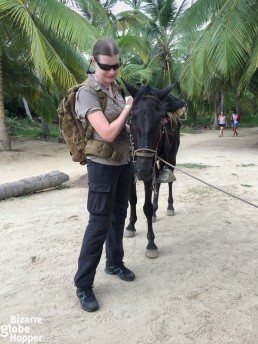 To craft your visit truly unforgettable and avoid the negative sides of tourism, check out our guide on visiting Tayrona National Park: “Beach Hopping by Horseback in Tayrona National Park“. We opted to stay outside the national park to avoid the masses and found our untamed paradise beach near the town of Palomino. We took a door-to-door minivan from Cartagena to our hotel La Mar de Bien near Palomino (4,5-7 hours, depending on the driver and company). It was cheaper, easier, and quicker than flying with ground transports at both ends (taxi to the airport, flight, taxi to either bus terminal and bus trip or one-hour taxi drive straight to Palomino from the airport). Locals prefer Santa Marta over Cartagena for its authenticity. 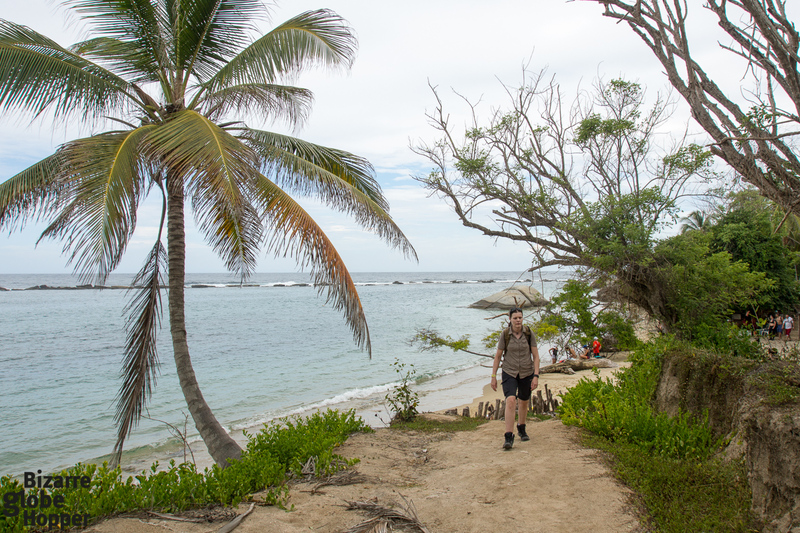 Many tourists visit Santa Marta only for the nearby attractions since it makes a great base for exploring Tayrona National Park and the nearby mountain village of Minca. 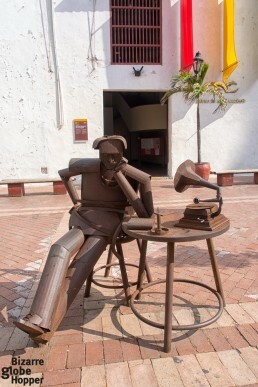 We’d recommend stealing a couple of nights from your 4-week itinerary for the colonial center of Santa Marta. 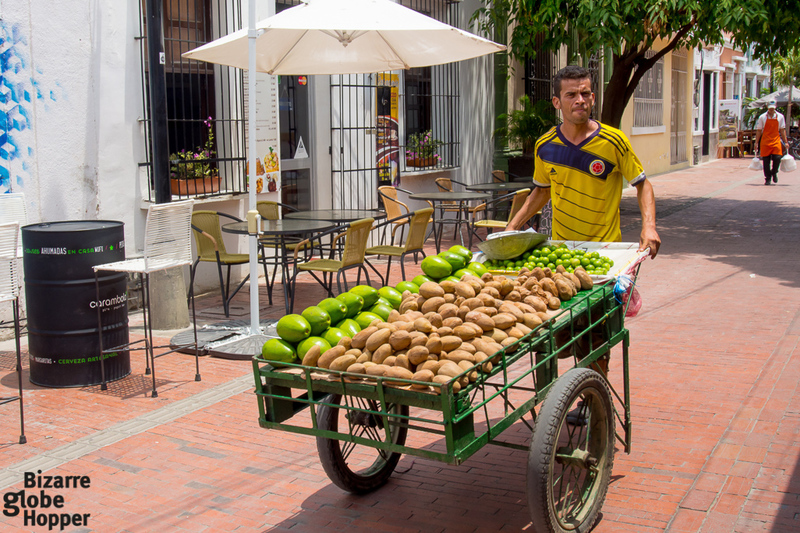 Choose one excursion (ours was Minca) and afterward just enjoy the treats of “a small city break”: stroll around the streets with locals, enjoy great dinners, and discover the hidden charm of this Colombian colonial city. “The authenticity” means that Santa Marta is not polished for tourists like Cartagena, and the experience will be more “raw”. There are just a couple of picturesque streets, a small park, and a short “beach boulevard”, where locals hang around street food stalls. Outside the colonial center, there’s not much to see. Nearby Taganga offers a backpacker-style beach getaway with bars and party vibe, but we’d recommend venturing into the beaches near Palomino for a secluded and boutique-style beach holiday. Sierra Nevada de Santa Marta mountain range can be visited on a day (or multi-day) trip from Santa Marta. If you yearn to hike, bike or ride on the mountain trails, it might be a better idea to take a tour from Santa Marta or overnight in Minca to arrange it independently. There’s a trailhead in the town (ask from locals) for a short independent stroll. 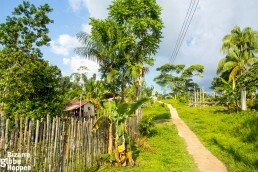 Also, an organic coffee plantation or some of the nearby waterfalls can be visited on an independent day trip. If you’re enticed to visit Minca but short on time, consider changing our itinerary so that you’d stay in Minca instead of Santa Marta. Door-to-door minivans are an affordable and relatively comfortable way to travel short distances in Colombia. 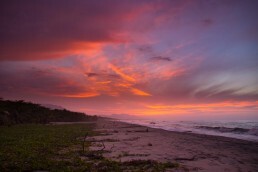 The travel time is only 1-1,5 hours from Palomino or Tayrona National Park to Santa Marta. There’s no direct bus between the center of Santa Marta and Minca. We negotiated a deal with a local taxi driver in Santa Marta to visit Minca for a couple of hours. You can also take a shared taxi/minibus from the Santa Marta market. Shared taxis are reasonably priced: around 8000COP per person. The drive takes only 30 minutes. 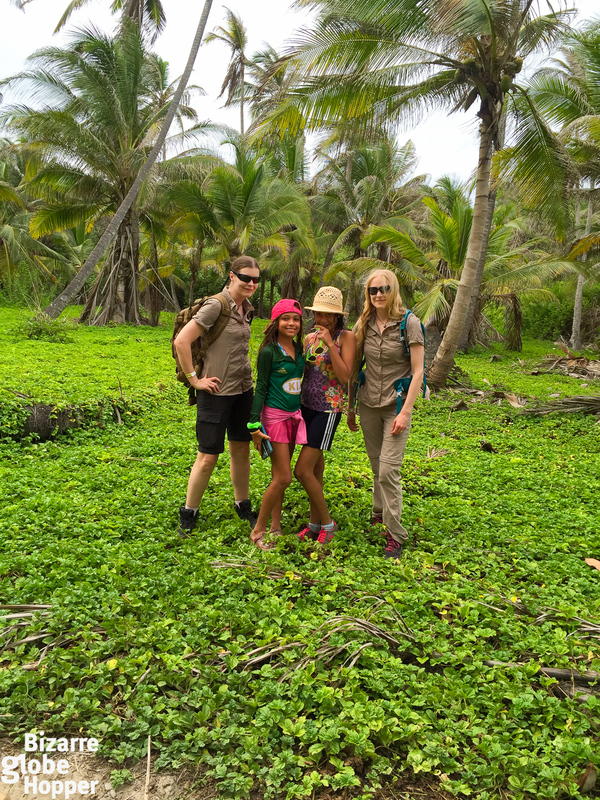 If you have more than one month in Colombia or would like to skip something on our itinerary, consider adding the Lost City (Ciudad Perdida) or La Guajira peninsula to your itinerary. For Lost City trek you’d need at least 4 days, but preferably an extra week for some relaxation afterwards. From Santa Marta area you can do just an overnight trip to La Guajira desert and the picturesque fishing village called Cabo de la Vela. Without visiting Medellin and the paisa district, you cannot say you’ve seen Colombia. 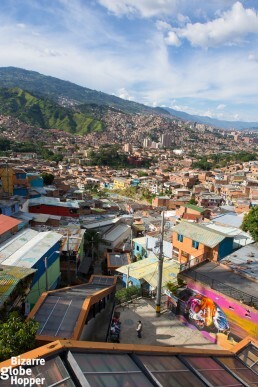 After the Netflix hit series “Narcos”, many tourists visit Medellin in search of the infamous Pablo Escobar sights. But Medellin is so much bigger than its narco reputation! 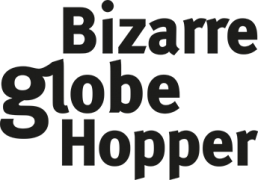 From the former murder capital of the world has risen unbelievably success stories, which are imitated in other troubled cities all around the world. Of course, things are not that black and white. 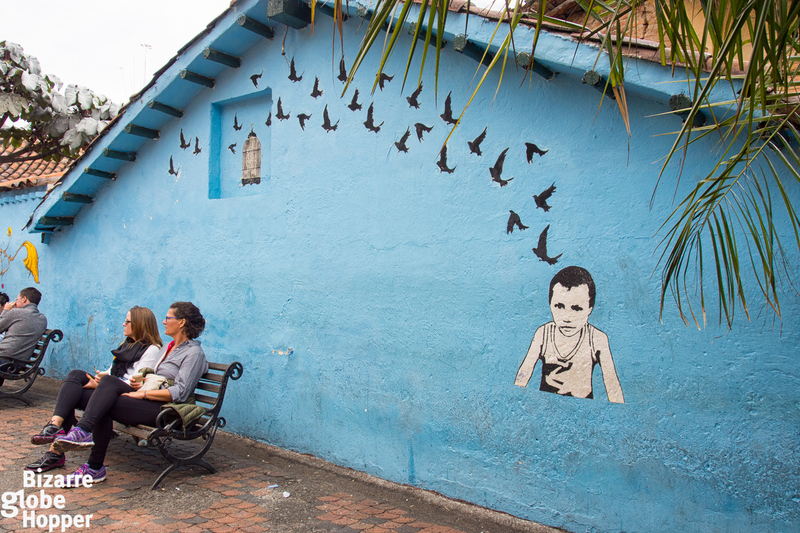 Explore Medellin on your own to draw your own conclusions. 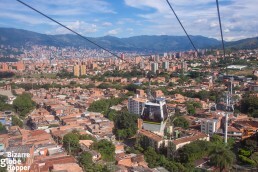 Medellin took me by surprise and jumped high to my list of favorite cities. 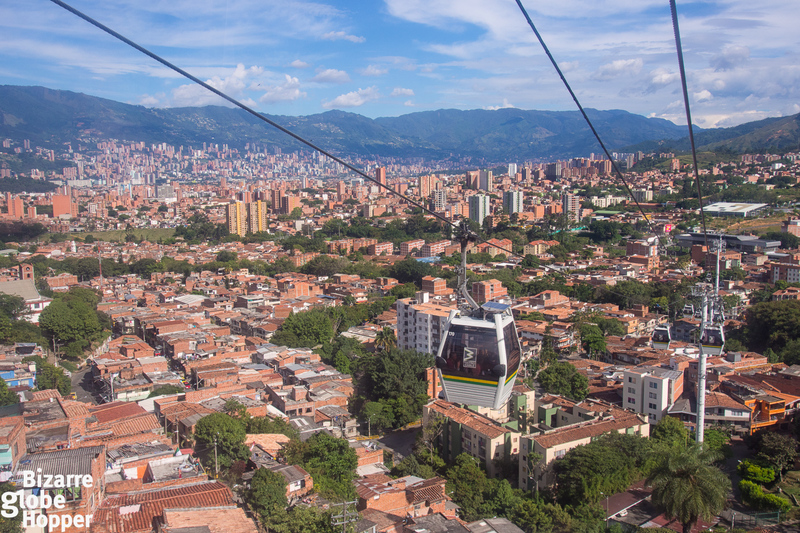 Nicknamed as “the city of Eternal Spring” and with hilly streets, Medellin reminds a lot of San Francisco. Every Colombia itinerary should include Medellin, no matter how many days or weeks you have in Colombia! Some of the main draws of Medellin: fantastic restaurant and coffee shop scene, a plethora of tours and activities from trampling the “Pablo Escobar trail” to paragliding and other extreme sports, the unexpected green oases around the center, outdoor escalators that have turned a former slum into a creative and safe neighborhood, the famous cable car, vibrant street art culture rivaling with the small art galleries and outdoor statues of Fernando Botero, and so complex and magnetic urban culture that I have to leave it for another article. Just for the craziness of it, we were supposed to take part in the paintball war at the ruins of Pablo Escobar’s former hacienda in Guatape. Unfortunately, the activity was canceled just before our tour, and the decision appears permanent. The quaint town of Guatape makes still a lovely countryside break if your Colombian itinerary allows a couple of extra days. 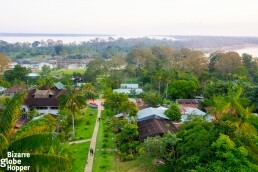 The town is located on the bank of an artificial lake that used to be among the favorite holiday destinations of drug lords at the time of Escobar. If your Colombia itinerary allows, I’d recommend expanding your stay in Medellin-Guatape area into one week. Our consolation prize was a thrilling experience of paragliding upon the red roofs of Medellin, click here to check out the pictures! We also loved exploring the street-art painted Comuna 13, formerly a notorious gang area, which has been uplifted to the new heights with the famous outdoor escalators. Avianca has one straight daily flight from Santa Marta to Medellin (1 hour 15 minutes), so grab it! We paid around 60$ per person. Other Colombian carriers offer the leg with a layover in Bogota. The bus trip from Bogota to Medellin is nightmarish and even locals avoid it – you’ve been warned. Even road trips through the mountains might turn out to be not so fun or safe (further details at the end of this article). The bus trip from Medellin to Guatape takes two hours, and the famous La Piedra (stone monolith) can be visited on the route. 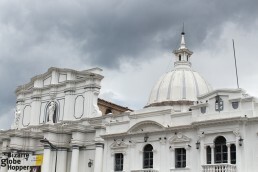 The white-washed Popayan inevitably collides with your itinerary, if you’re planning to visit the archaeological treasures of San Agustin or Tierradentro. Yet another Colombian colonial town, you might think. Somehow Popayan is still different. 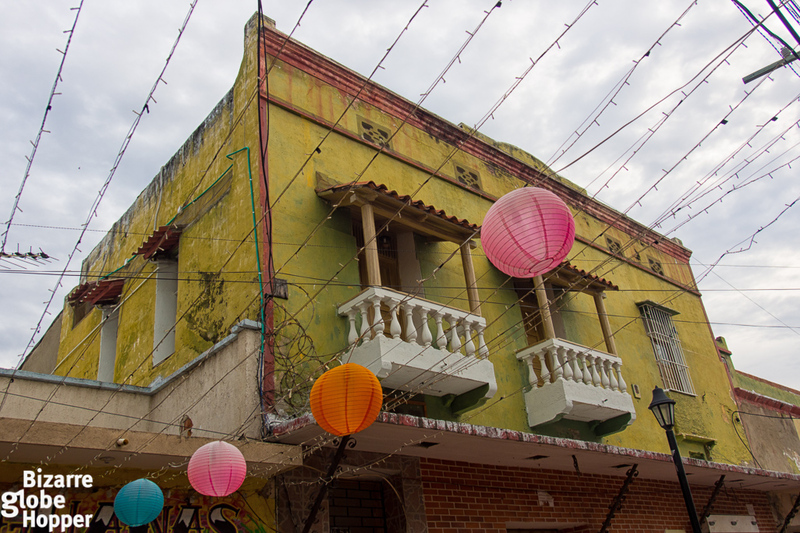 It feels even more authentic than Santa Marta, and you won’t see many other tourists. 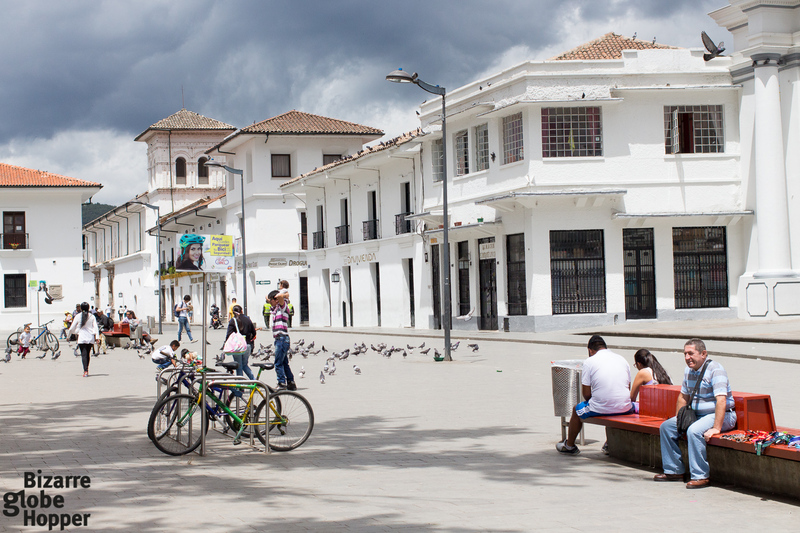 To be honest, Popayan was our least favorite place in Colombia. Still, we were glad to experience its unique atmosphere. It’s said to be the most religious city in Colombia, so if you’re into churches and monasteries, you’ll appreciate it more than we did. Nearby mountain village Silvia hosts a colorful market every Tuesday, and other villages and thermal springs can be explored on a horseback riding or mountain bike trip. Once again: getting to Popayan is easiest with domestic flights. Bus travel or self-drive is doable but would require changing the itinerary since it would take days to drive from Medellin to Popayan. We reserved our flights pretty late and ended up paying around 100$ per person. If you’re considering road travel from Medellin to Popayan, expand the itinerary and stay 2-3 days in the “the coffee triangle” (the town of Salento or bigger cities of Manizales, Armenia, and Pereira) and Cali respectively. I’d add a one-week loop in the case of road travel. If you have time and don’t hate long drives or bus trips, I’d even recommend expanding our one-month itinerary into 5 weeks! 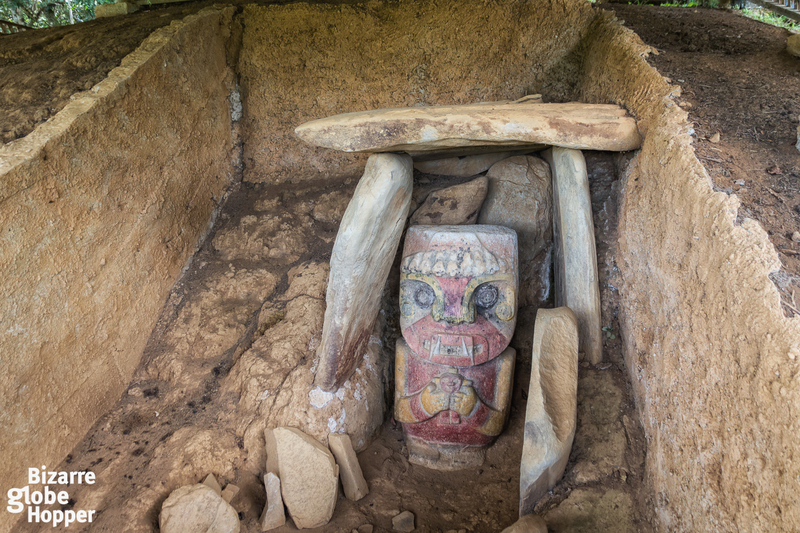 San Agustin is considered as the most important archaeological site in South America, surprisingly winning the title from the hyped Machu Picchu. While we loved them both, I’d probably pick the less visited San Agustin as my personal favorite. 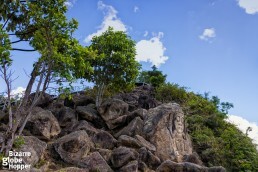 The cryptic stone statues, graves, and ceremonial sites are scattered around stunning river valleys, jungle, and rolling hills. Horseback riding between the archaeological sites of San Agustín makes an exciting day trip. Hiking inside the archaeological park of San Agustin deserves another day. The small town charm keeps you entertained for a couple of days, and the waking tourism boom has brought a couple of good hotels and restaurants. 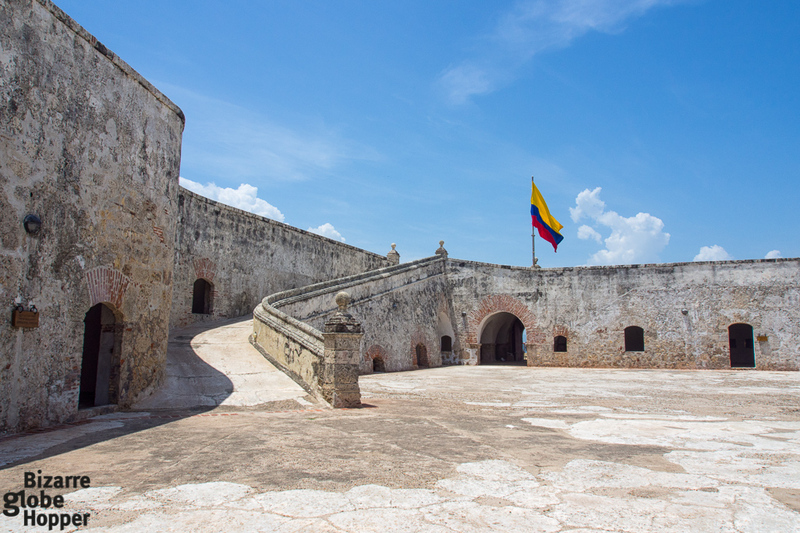 If you have more than two weeks in Colombia, please include San Agustin in your itinerary! In our itinerary’s southwestern loop, road travel is your only choice. Luckily, it’s worth the effort this time! The road winds up to the scenic high-altitude páramo almost straight after Popayan, and it’s dubbed as the most beautiful bus route inside Colombia. 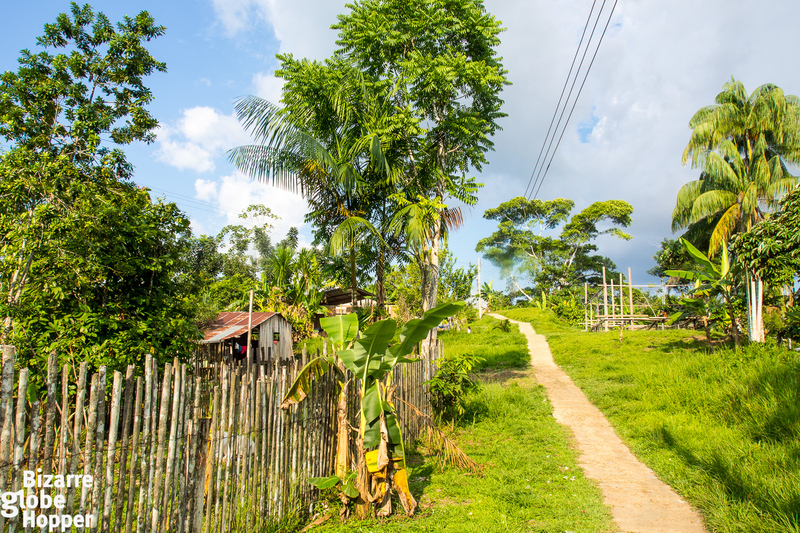 Local bus crawls the distance between Popayan and San Agustin in 4–7 hours; minivans can speed it up even to 3 hours. The road is getting paved slowly, cutting travel times each year. Tatacoa Desert is among the Colombian destinations that scream magical realism. It’s hard to believe that such a mini-desert with canyons reminding of Arizona even exists in the middle of green hills and mild tropical climate of Colombia. Near the visitors’ center and observatory lies “the red desert” with a labyrinth of narrow pathways. To keep things even more interesting, a short moto ride takes you to the “gray desert”, which has its own oasis, a natural pool. This is the second – and last – leg in our 4-week itinerary requiring road travel. Minivans can cut the distance between San Agustin and Neiva into 4 hours (reserve longer, if you go through Pitalito). 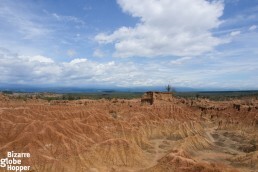 Tatacoa Desert can be visited on a day trip from Neiva (take a taxi to the desert or a minivan to the village of Villavieja, from where you can hire a moto taxi). With its observatory, Tatacoa Desert is a perfect spot for stargazing, so feel free to stay there, if you’re not afraid of basic accommodation. We opted to stay in Neiva for comfort and great food – one of the best dinners we had during our one month tour in Colombia. I’d strongly recommend including Tatacoa Desert into your Colombian itinerary, though it’ll mean an extra loop. We flew from Neiva to the Amazon to minimize transit time. 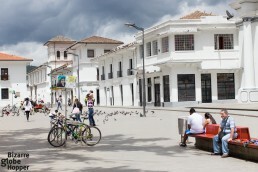 Bus from Neiva to Bogota takes around 6 hours; Avianca has several direct flights daily. Amazonas (4–6 Days): Explore the Colombian Amazon – or Visit Brazil and Peru! Visiting Amazon is an essential part of experiencing the multiple faces of Colombia – and shouldn’t be left out of the one-month itinerary. Amazonas, as Colombians call their stretch of the river basin, covers a third of Colombia. Visiting Amazon on the Colombian side will feel more authentic than embarking on the jungle adventures from the Brasilian or Peruvian side. 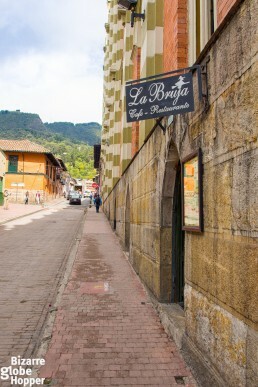 The Colombian border town of Leticia rivals those of its neighbors, and if you pick a good hotel, it could even feel a pleasant small town for a couple of days. Get inspiration for your stay from our list of “Best Things to Do in Leticia”. Still, Leticia is just a starting point for your Amazon adventures. Venture deeper with public or private boats and take hikes in the rainforest, visit indigenous tribes, spot pink and gray river dolphins, and go fishing if you please. We stayed two nights in Leticia and two nights in the small eco-village of Puerto Narino, 75 kilometers upstream from Leticia. Puerto Narino is an excellent base for independent Amazon adventures. There are a couple of decent lodges, and plenty of villagers are eager to take you on affordable, yet private Amazon excursions with their wooden fishing boats. Ready-made Amazon tour packages come with hefty price tags. Search online before you book to make sure that the guides and lodges will meet your expectations. 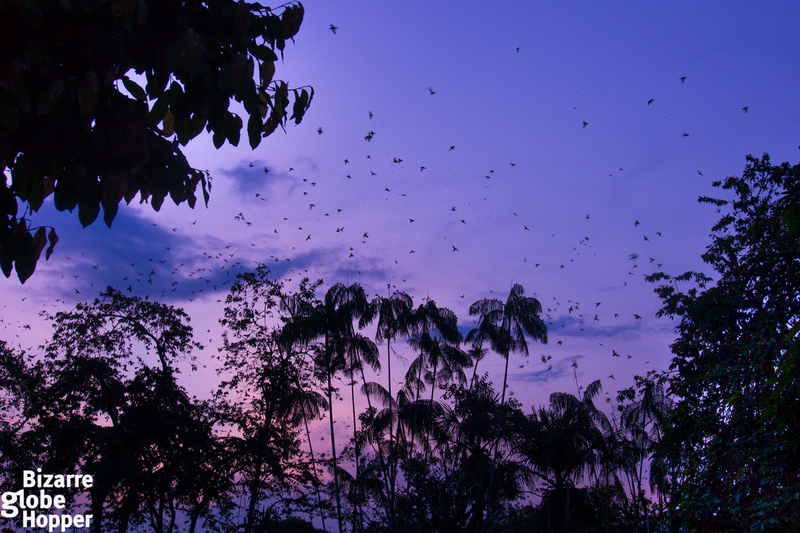 If you’re visiting Colombian Amazon, the flights are obligatory. There are no roads to Leticia from the Colombian side. We paid 80–100$ one way, per person. Rather high price is the main reason why many tourists drop Amazon from their itinerary. Here’s the trick: we encourage you to fly from any destination inside Colombia to Leticia. You’ll have a layover in Bogota, but according to our investigations, the multi-destination flight will be only a slightly more expensive than a single leg from Bogota to Leticia. We paid around 100$ for the Neiva-Leticia leg and 80$ for the Leticia-Bogota leg. Book early for the best deals; we reserved all our internal flights pretty late. From Leticia, we took a public riverboat to Puerto Narino (75 kilometers, 1,5-2,5 hours) in the Colombian Amazon. Book tickets at the port the day before. Please, add at least one full-day Amazon tour into your Colombia itinerary! Whereas many capitals in southern or central America feel rather ugly, Bogota is a cool and even beautiful colonial city. If you’re into museums, reserve more than two days: in Bogota, you’ll be spoiled. I love the hilly layout and tourist-filled old town La Candelaria, but it’s the strike of “urban cool”, similar to that of Medellin, which charms me even more. 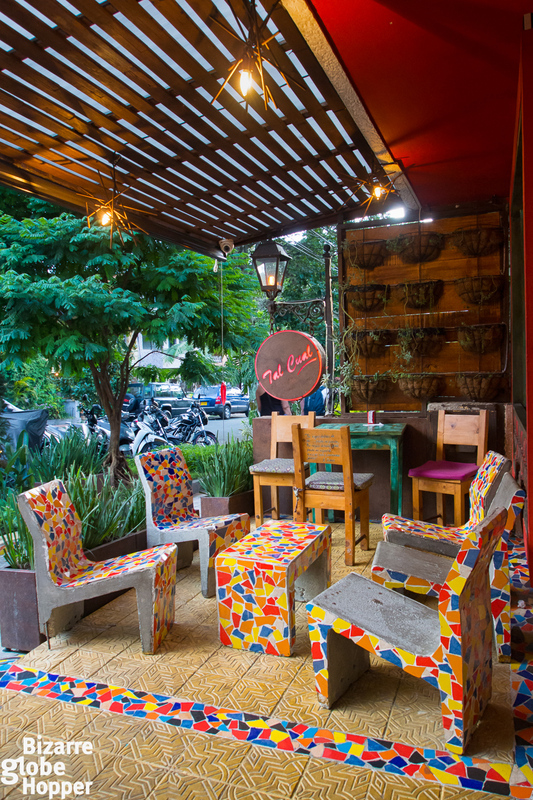 Sample some of the best coffee in the world in hipster coffee shops in up-and-coming Chapinero area, follow the beats to the clubs of nearby Zona Rosa, and climb to green Cerro de Monserrate to escape it all. Due to the international airport, your itinerary in Colombia probably starts and ends in Bogota. We had only 2 nights to spare in the capital, which allowed us to see only a scratch. 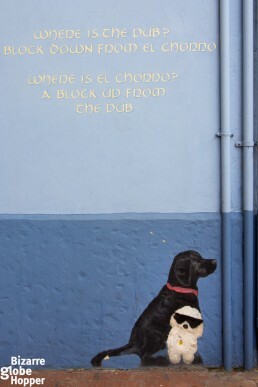 If your itinerary allows, stay longer for a more thorough urban exploration – oh yes, the street art scene is booming. In the meantime, raise your spirits by sampling our guide to the best cafés in Bogota! We did a massive legwork to dig out the best boutique hotels in Colombia. Our picks include affordable design hotels in the big cities of Colombia, genuine boutique hotels in San Agustín and the Amazon (yes, you can do those Amazon adventures comfortably! 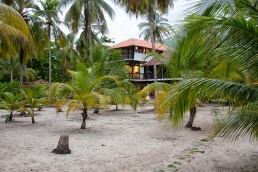 ), and a secluded beachside villa near Tayrona National Park. Check out our list of the affordable boutique hotels in Colombia to spice up your Colombian itinerary! If boutique hotels are not your thing, we have even better news for you! Traveling on a tight budget and staying in hostels is so much easier than trying to find luxury hotels in Colombia. 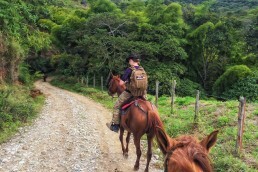 So, just enjoy the easy ride while backpacking in Colombia. 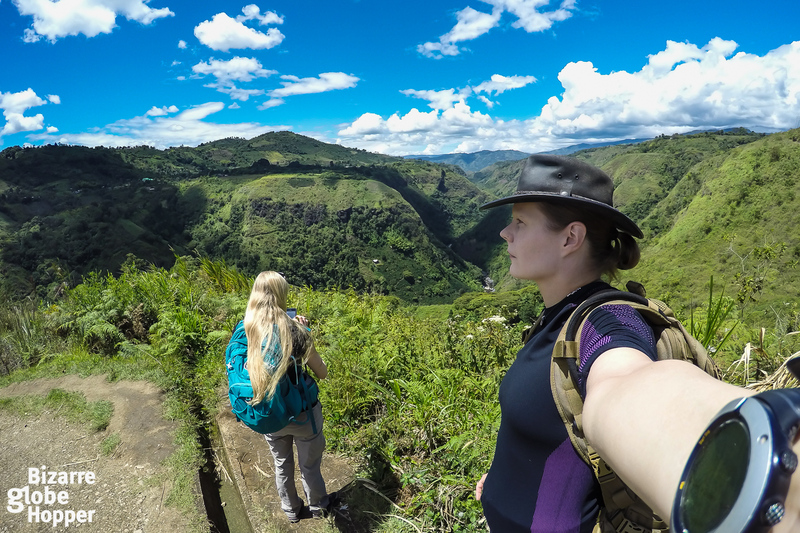 During our one-month tour in Colombia, we preferred flying instead of exhausting drives or uncomfortable bus trips. Distances are long, the Andes and other mountain ranges pierce the country, and many roads remain unpaved. We needed five flights to complete this 4-week itinerary on a relatively tight schedule and were extremely happy with the Colombian domestic carrier Avianca. However, the default flight prices for foreign visitors are rather high. Check out our flight hacks and book the domestic flights in Colombia at cheap, local fares! Unless you are blessed with unlimited time, you’d need to decide which destinations to skip, since all the enchanting sights of Colombia would keep you busy for months. Hence, this 4-week itinerary highlights our interests and is overshadowed by the fact that we needed to prioritize. The biggest miss for us is the Lost City trek. We would have needed a week more – or at bare minimum four days – to complete it. So feel free to tweak our itinerary into a 5-week tour with Ciudad Perdida trek. 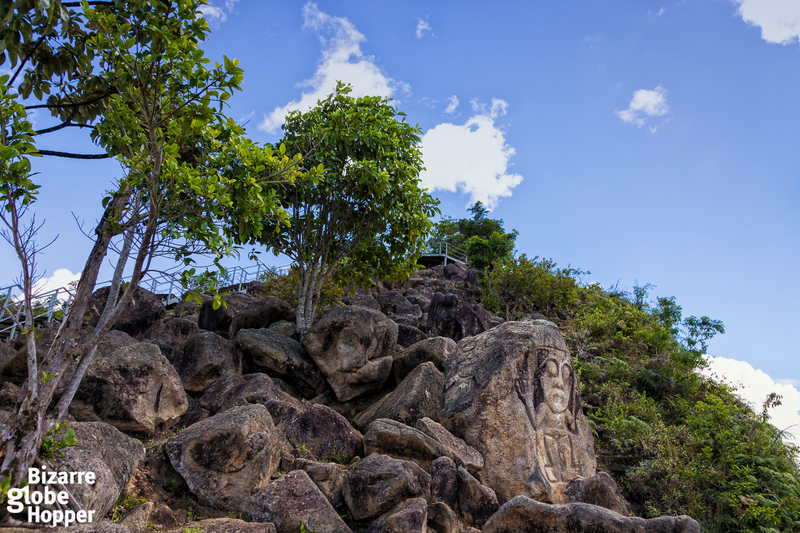 For us, the Lost City is a perfect reason to return to Colombia! Personally, I would have wanted to visit the sand dune beaches of the remote La Guajira peninsula, which can be reached by a long jeep journey from Santa Marta. I love islands, so it was extremely painful to drop out the Caribbean islands of Providencia and San Andres. High flight prices (even with the flight hacks) helped me with reasoning. 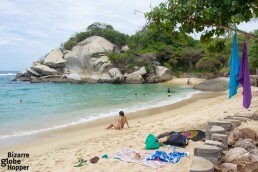 The untamed beaches near Palomino and inside Tayrona National Park did the job this time. I’d suggest adding an extra week in your itinerary for either the Caribbean Islands or El Cocoy, which comes next on our list. I was eager to also include a longer trekking trip to the Colombian mountains, preferably in the national park of El Cocuy, where the snow-capped peaks reach out to staggering 5 kilometers. Luckily, we saw drastic high-altitude páramo landscapes on our journey from Popayán to San Agustin. As a fresh bouldering enthusiast, I yearned to test my skills on the massive rock wall of Suesca, so I tried my best to lure Piritta into this small town with ghost stories, but without success. 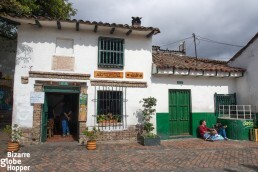 Suesca can be reached on a day trip from Bogotá, but I would have combined it with the colonial gem of Villa de Leyva. 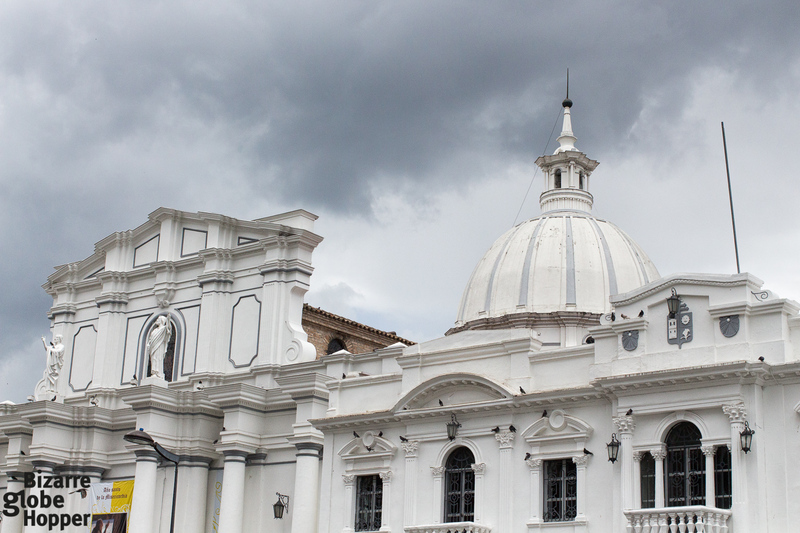 Cartagena, Santa Marta, Bogota, and Popayan showcased us the colonial roots of Colombia during our one month tour. If you feel the need to fine-tune your “time travel vibes”, just add one of the smaller colonial towns, such as Mompox, Jardin, Villa de Leyva, or Barichara, into your Colombian itinerary. 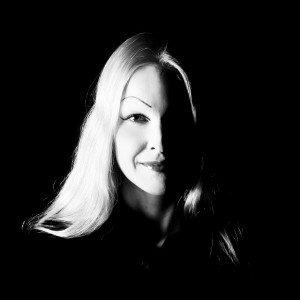 Piritta’s major tweak in this itinerary would be to add more time in the Amazon. Visiting the reserves on the Peruvian and Brasilian side remain in our dreams. But we know that we will return to the Amazon; so those adventures will wait for us. Then there’s of course ”the coffee triangle”, which was on our itinerary until the nick of time. We decided to trade the picturesque coffee town of Salento, hot springs near Pereira, and horseback riding amidst the towering wax palms of Valle Cocora into the adventurous triangle of Popayan, San Agustin, and Neiva. However, we were happy about the choice since San Agustin was one of the highlights of our 4-week Colombian tour! As coffee geeks, we got the best fix ever in the specialty coffee shops of Bogota and managed to find great brews also in Cartagena, Santa Marta, and Medellin. 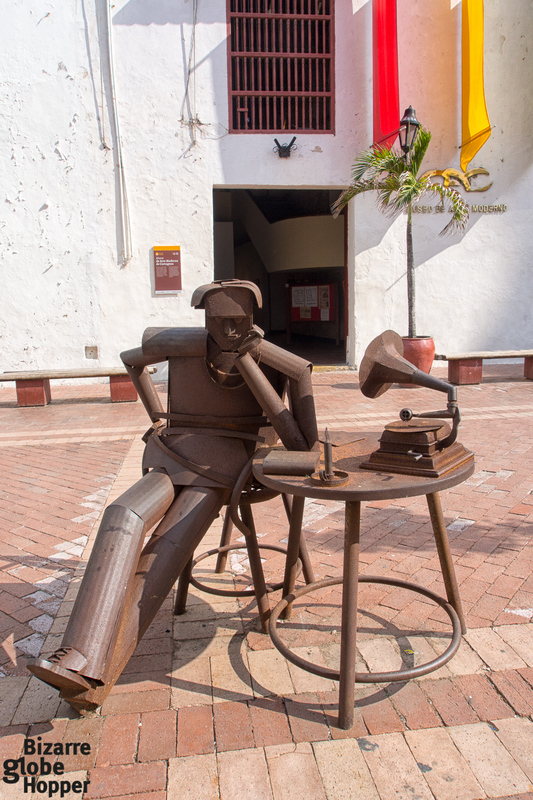 If you have more than one month in Colombia, the coffee triangle is a perfect one-week add-on to any itinerary. We’ve visited several coffee farms during the last years and were just looking for the best quality beans from small producers, which are usually hard to find outside specialty coffee shops. Smaller farms tend to export their gold, and even bigger farms might not sell their best beans on the spot. I still have one recommendation, if you’re a coffee enthusiast. Go off the beaten track and visit the rising star of Colombia’s specialty coffee trade, La Palma & El Tucan.  They’ve recently opened “an experimental boutique hotel”, which allows ordinary coffee tourists get a unique glimpse into a modern coffee farm. Their beans are to die for, and you can find them also in Bogota. The farms inside the Colombian coffee triangle tend to be old-fashioned and extremely touristy to my likings. As you can see, our one-month itinerary in Colombia was full of compromises, because the country is so tremendous. If you can, spend more than one month and explore deeper than we did to avoid tough calls. Still, even a 4-week tour in Colombia will steal your heart! 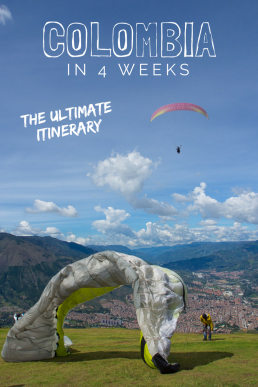 One Month in Colombia: Should You Fly, Drive, or Take Buses? Congrats for hanging along this long: you already know our answer! Since we hear this question a lot, I decided to give a bit longer explanation. Internal flights safe both time and money, but most importantly, they save your nerves. Road travel is slow in many regions, mountain roads might be dangerous, and locals drive like crazy. Road accidents are the leading cause of death for young people in Colombia. The door to door vans offer quicker – and generally more comfortable – transits than buses, but many drivers are risking safety with their speed. Is Car Rental Cheaper than Flying? Internal flights are generally cheaper than renting a car for a couple or max. three-person group. If your party is larger than four, renting a car might get cheaper than flying around. Still, I’d calculate all expenses carefully, as road tolls are rather expensive. If we’d travel through Colombia for another full month, I’d still fly around like we did on our first tour. Additionally, I would rent a car for some areas for easier access to off-the-beaten-path destinations, like La Guajira, Jardin, and San Agustin/Tierradentro. I would definitely avoid using buses for distances that take longer than one hour and use private transfers instead. Like in many other countries in South and Central America, bus travel in Colombia is unpredictable and tiring. Then again, these choices affect your budget. If you’re backpacking in Colombia and used to travel by buses in South and Central America, you will be totally fine with the local buses. If you’re a flashpacker, as I could describe ourselves, consider investing 200-700$ (per person, depending on your destinations) in domestic flights, door to door vans, and also possibly private transfers/car rentals. For families, I’d suggest flying if your budget allows: it’s considerably safer and stress-free. President has declared World Cup match days as a national holiday – Colombians are crazy about the football! In his heyday, Pablo Escobar used to smuggle 15 tons of pure cocaine into the US each day, collecting 420 millions a week! Colombia is all about renaissance: for example, Medellin was known as “the murder capital of the world”, but now its success story is imitated around the world. The mythical El Dorado and Macondo have their roots in Colombia. The birth town of Gabriel García Márquez even tried to change its name into Macondo! Since we’ve been asked a lot if it’s safe to travel to Colombia this year, here’s our opinion. Colombia is a perfectly safe destination for Americans, solo female travelers, and families with small kids. We encountered plenty of American travelers during our 4-week tour, in all areas of Colombia. Of course, before booking a trip to any destination, you should check the current travel warnings. Here you can find the latest, updated travel information from the US Department of State. According to the current travel warning, tens of thousands of US citizens visit Colombia safely each year. There have been no reports of Americans targeted based on their nationality. It’s safe to visit the majority of the tourist destinations – and all destinations listed in our Colombian 4-week itinerary. Although the security situation in Colombia has improved radically, due to narco-trafficking and guerrilla (and paramilitary group) activity, there are still some “red zones”, which you’d probably like to avoid. Plan your itinerary carefully to also avoid ground transport through the areas with a travel warning. Luckily, internal flights are cheap in Colombia (especially if you use our flight hacks), so you can visit all the tourist areas safe and sound. If you have any concerns about visiting Colombia or questions about our 4-week itinerary, please just ask in the comments below – we are happy to help! Thanks for the post! We’ll be in Colombia in a few months, and we’re taking our 4 kids. Do you think all of the places would be for the likes of kids too? 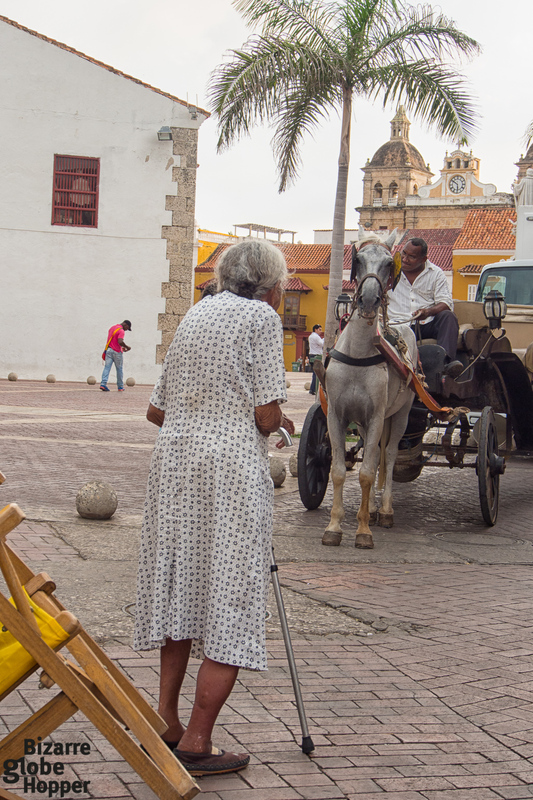 I have only been to Cartagena as a cruise port, and can’t wait to get back to Colombia. Your photos are either wonderful memories or inspiration. I can’t wait to get into the amazon. Thanks for the airfare tips, as Bogota is on the destination list as well. This is a great itinerary! 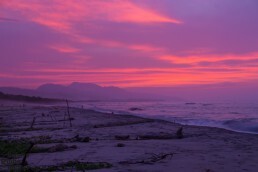 We chose the opposite – we skipped Popyan etc for Salento and the coffee region, and San Gil. As it turns out, just about everything in Colombia is fantastic and worth a visit! We spent a month as well and are yearning to go back for more. Our favorite country in South America for sure! Hi Lia! Haha, we would have loved to visit both Salento and San Gil, but were short on time. Too many tough choices – maybe next time. Colombia rocks! This is the best practical guide I’ve ever seen on a blog!! I think it will come very useful at the right moment!! I visited South America two years ago but because I had to fly home sooner than expected I never made it to Colombia (although Peru and Bolivia were amazing!) so I’m desperate to go back and visit.